Inn At Fort Grizzly Our records show that this inn is closed. Andora Crossing Our records show that this inn is closed. D-Railed Ranch Our records show that this inn is closed. Debra Ann's B&B Our records show that this inn is closed. Gotland's Inn Cave Creek Our records show that this inn is closed. Happy Hidden Ranch Our records show that this inn is closed. Cave Creek bed and breakfast travel guide for romantic, historic and adventure b&b's. 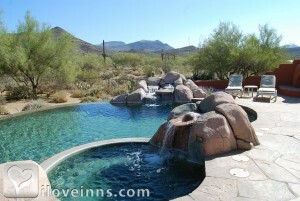 Browse through the iLoveInns.com database of Cave Creek, Arizona bed and breakfasts and country inns to find detailed listings that include room rates, special deals and area activities. You can click on the 'check rates and availability' button to contact the innkeeper. One of the most amazing towns in Maricopa County, Arizona is Cave Creek. Stay at any Cave Creek bed and breakfast inn and experience what true Arizona really is. The Sonoran Desert, some of the most exciting shopping, and the many art galleries are popular with visitors. Do not miss out on Cave Creek Museum where some of the greatest prehistoric signs of culture and legacy of the first Cave Creek inhabitants can be found preserved. For the always on the go hiker, there is the Go John Trail which goes around a mountain which gives the impression that you are miles away from civilization when you are just on the other side of the mountain. Do not forget the latest addition to the park system which is the Spur Cross ranch Conservation Area. By Full Circle Ranch Bed & Breakfast. If you are looking for a getaway spot with a twist, the town of Cave Creek in Arizona is the place to visit. It is not everyday that you find a site like Cave Creek, where modern hints of time meet a well preserved Wild West character. While the town was initially known for its gold mining activities, it is totally different from other gold mining towns. Cave Creek is known for its numerous saloons such as Harold's and Buffalo Chip. With live bands playing every night, poker tournaments, trivia, and charity casino nights, anyone visiting Cave Creek will be really kept occupied all throughout their stay. Dining is not a problem in Cave Creek, thanks to the different established diners and eateries such as the Tonto Bar and Grill. Stay at any Cave Creek bed and breakfast and get to know the (different) Wild West side of the United States! By Spur Cross Bed & Breakfast.